I love baking all year round but there is something special about baking around Christmastime. The music, the fact it’s cold outside but warm inside, the hot coco, it’s just magical. I love making cookies, cakes, brownies and today I am going to share one of my favorite recipes. It’s for those times you feel like something delicious and sweet but can’t decide between a cookie or brownie. This happens to me at Panera all the time, I can’t be the only one, right? Well, sometimes you shouldn’t have to make Sophie’s Choice over dessert, just have both in one! Two desserts with the calories of one means one less trip to the gym to work off the holiday weight. 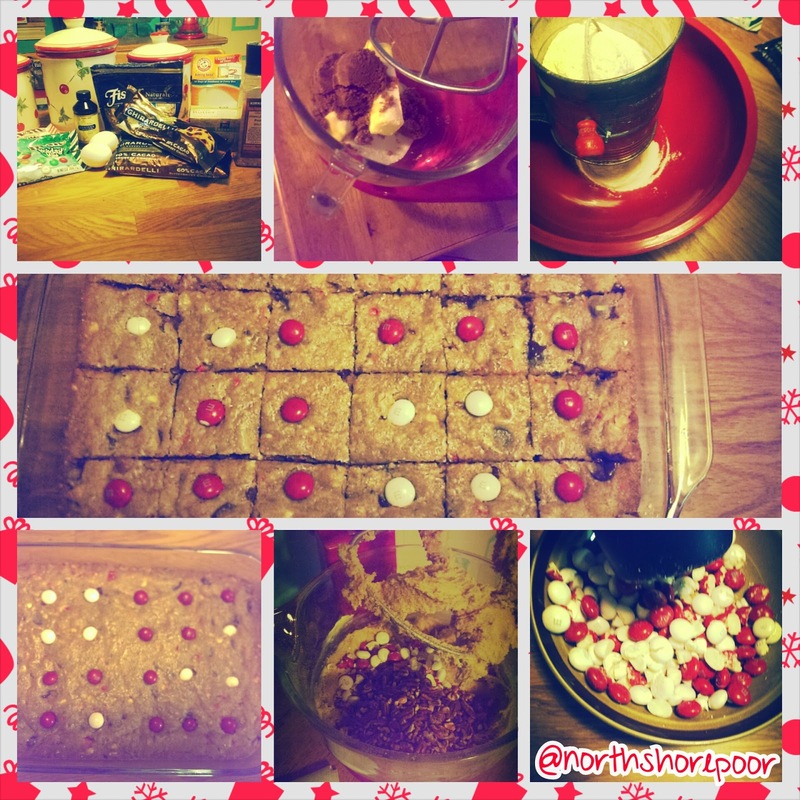 North Shore Poor’s Christmas Cookie Bars! 3. Gather the above ingredients. Feel free to substitute the M&Ms for any flavor they have or even just white chocolate chips. Just use the same amount. It’s a personal preference. I like my desserts like my man, white chocolate. Ba-dum-bum chsh! 4. Put the 2 softened sticks of butter, the vanilla, and both the sugars in the mixing bowl. 6. I like using a sifter so I put that in the mixing bowl and add the flow, salt, and baking soda. Sift. 7. Are you having hot chocolate or a glass of wine? If not, grab a drink and sing along to the music. 8. Go to the bowl with the sugar and add one egg and mix. 12. So you can use the M&M’s whole but I like to crush mine up a little. So I just poured them into a bowl and used the back of the measuring cup to crush them. Not fancy but it works well and makes no mess. 18. Bake for about 20-22 minutes. The sides will be brown like a cookie and the top should be golden brown as well. 19. Cool for about 10 minutes and if you want, add an M&M to each piece you plan on cutting. 20. Wait another 20 minutes or so and then cut! You can really modify this recipe which makes it really fun and a great staple for your cooking repertoire. You can add coconut, peanut butter, different nuts, or simply add mint chocolate chips instead. Having a nice glass of Pinot Grigio always helps as well. Plus, to keep from these all myself I plan on letting JoeyWaffles bring them to his work and share. We can keep a few at home but no need for temptation! What are your favorite holidays treats? Do you love holiday baking or hate it?